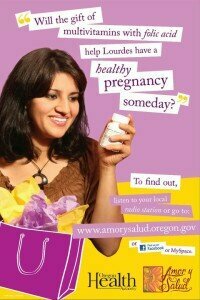 In Oregon, a preconception health program attending to the needs of Latinas was developed. In order to improve cultural relevance, the program decided to experiment with the health promotion medium. Amor y Salud (Love and Health) is the title of a preconception health campaign that used the popular Spanish radio soap opera (radionovela) format to deliver preconception messages to Latina women (45). Instead of stacking pamphlets in doctors’ offices, this program used familiar communication devices to convey important health information in their own language. 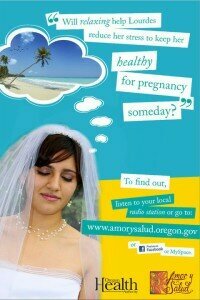 Women were able to access Amor y Salud through radio, Facebook and MySpace. Although there were impediments to the systematic evaluation of the intervention, the researchers concluded that it is possible to design culturally specific, community-informed, low-cost preconception messages that will reach a large population; for about $31,000, the radionovela episodes were played on the radio over 2000 times, and the Facebook page was viewed 11,000 times. 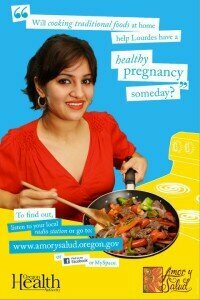 Listen to the radionovela on the Oregon Public Health website.